Today in Leipzig, 300 industry and government officials representing vocational training initiatives worldwide, gathered at the WorldSkills Leaders Forum. WorldSkills was honoured to welcome Brazil’s Former President Lula as the keynote speaker followed by TV celebrity contractor, Mike Holmes. President Lula reminisced of his past experiences in the industrial sector and his passion for vocational training. Through this passion, he has initiated a number of programs in vocational skills and training for his country. On behalf of Brazil, President Lula looks forward to hosting the WorldSkills São Paulo 2015, 11-16 August 2015. 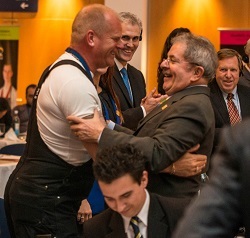 David Hoey, CEO of WorldSkills International, presented President Lula with a special edition of the WorldSkills Leipzig 2013 gold medallion for his dedication to the skills movement in Brazil. Mike Holmes, Canada’s Most Trusted Contractor, skilled trades advocate and star of the hit series, 'Holmes on Homes' on HGTV inspired the audience and expressed his wish to have the Competition televised around the world by 2015. Mike is the National Spokesperson for Skills Canada and supports education on the importance of quality workmanship, safety and training. Mike is committed to showing the world what WorldSkills is, and how excellence in vocational skills deserves to be showcased on a global platform. "I want youth to see, taste, smell and feel the passion that WorldSkills Competitors have for their trades." Holmes spoke to the shortage of skilled workers world-wide, and that by 2016 there will be 1.5-million skilled-job vacancies in Canada alone. During the WorldSkills Leaders Forum, Mike also accepted the role of being a WorldSkills Ambassador. Photos of the Leaders Forum are available on Flickr.